Her feast day is February 23rd. 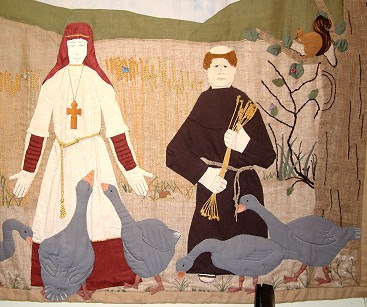 She once prayed to help farmers with an enormous flock of birds that were gobbling up all their fields. They all flew away. She has since become the patron saint of pet birds. Bless you, Esther, for this special entry!! As always, you find and share the most precious information with us!! I recall having seen the name of St. Milburga some time ago but did not know of the special connection for our feathered friends.